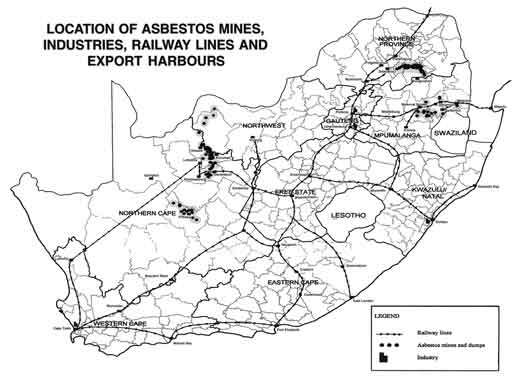 South Africa has possibly the highest incidence of malignant mesothelioma anywhere, thanks to more than a century of mining asbestos in the Northern Cape, North- West, Limpopo and Mpumulanga provinces. There are three types of asbestos and all were mined in South Africa; the most carcinogenic is crocidolite, of which production peaked in 1977. 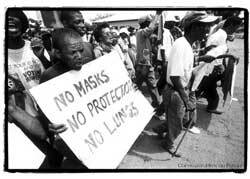 The last asbestos mine closed only in 2002, and massive environmental contamination from unrehabilitated mines and mine dumps will ensure ongoing exposure well into the future. 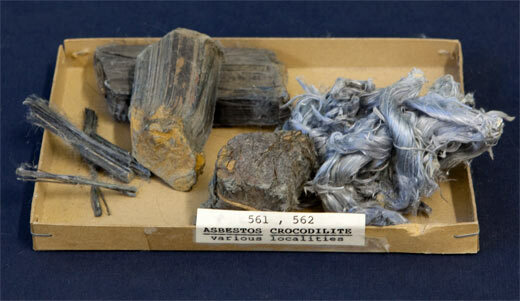 Raw Crocidolite (blue asbestos) and asbestos wool. The pneumoconiosis asbestosis, which is a diffuse pulmonary interstitial fibrosis that can be distinguished from other pneumoconioses such as silicosis (miner's lung) by the presence of phagocytosed asbestos fibres "asbestos bodies". Benign fibrocalcific pleural plaques on the parietal pleura of the lungs or overlying the diaphragm. A 5-fold increase in lung cancer in those with occupational asbestos exposure, and in workers who smoke the combined effect of asbestos and tobacco is a 55- fold increased risk. 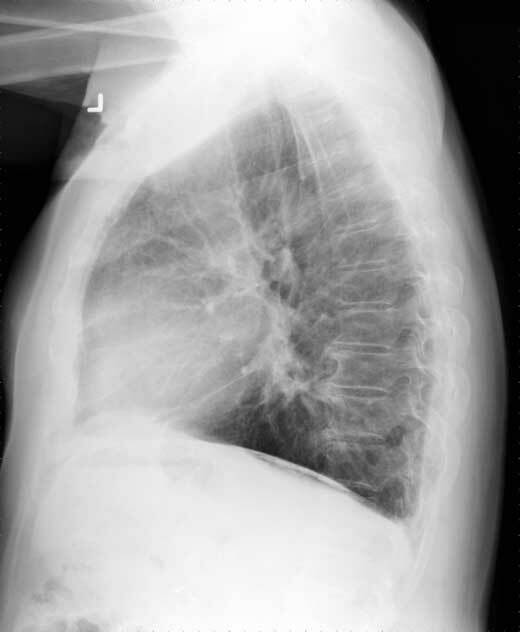 Lateral chest X-ray, showing early asbestosis with diaphragmatic plaque. These specimens were removed from an elderly man who was severely emaciated. Displayed are the right dome of diaphragm and a portion of three ribs covered by pleura. On the pleural surface there are numerous raised, pearly nodules of fibrous tissue. 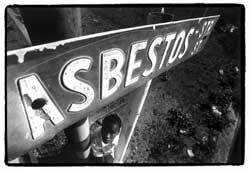 Pleural plaques are strongly linked to asbestos exposure. They may be found in association with mesothelioma, but do not appear to be a precursor of the malignancy. Mesothelioma is a diffuse tumour that spreads in the pleural space and envelopes the lung. It is usually associated with profuse pleural effusion; sometimes the diagnosis is made on cytology from a pleural aspirate. 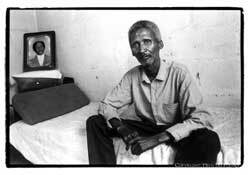 It tends to directly invade the lung and thoracic structures, metastasise to hilar lymph nodes and eventually to other organs. Microscopically malignant mesotheliomas are epithelioid, sarcomatoid or mixed, reflecting the two potential development paths of mesothelial cells. Mesothelioma invading the lung can be difficult to distinguish from adenocarcinoma invading the pleural space, even on microscopy, and a panel of immunohistochemical stains or electron microscopy may be needed to help conclude the diagnosis. Other sites for mesothelioma are peritoneum, pericardium, testis and genital tract, with peritoneal mesothelioma being strongly related to heavy asbestos exposure. The oncogenic path from asbestos exposure to cancer has not yet been fully explained at a biochemical / molecular level. One interesting possible factor links to the profusion of macrophages attracted to asbestos in the pleurae; after phagocytosing asbestos fibres macrophages generate hydroxyl free radicals which are known to be clastogenic i.e. can cause chromosomal breaks. The typical presentation of mesothelioma is chest pain, dyspnoea and recurrent pleural effusions. Aggressive surgical chemo - and radiotherapy are used in treatment, but 50% of patients die within 12 months of diagnosis, and the remainder in <2 years, with few exceptions. The patient, a 40 year old woman, presented with a relatively short history of cough, fever, pleuritic pain and dyspnoea. On examination she had signs of a pleural effusion on the right side; it was repeatedly aspirated, but filled up again very rapidly. Her condition deteriorated steadily to death. 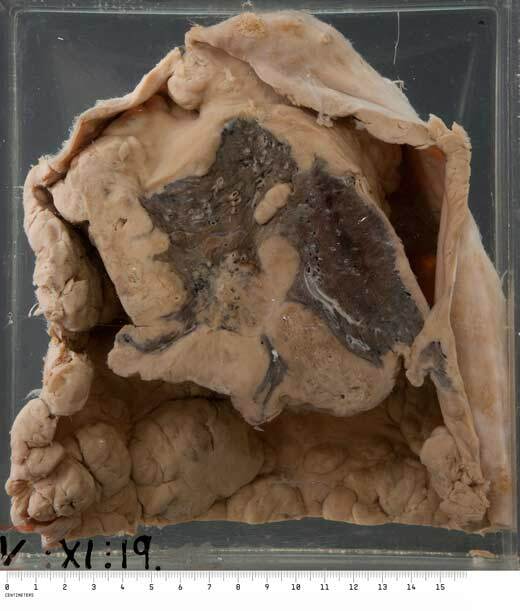 The specimen shows the right lung completely encased in a thick layer of tumour which is also involving the parietal layer of the pleura; the space in between was occupied by blood-stained fluid. The neoplasm, which appears to be in the substance of the lung, is actually in the interlobar fissure. This patient was a 22 year old man who presented with a 3 month story of right-sided pleuritic pain and progressive dyspnoea, accompanied by loss of weight. Blood-stained fluid was aspirated from the right pleural cavity; the cytology suggested the diagnosis of mesothelioma. At autopsy the right lung was collapsed and invested in a layer of friable necrotic tumour tissue varying from 2 - 10 cm in thickness. 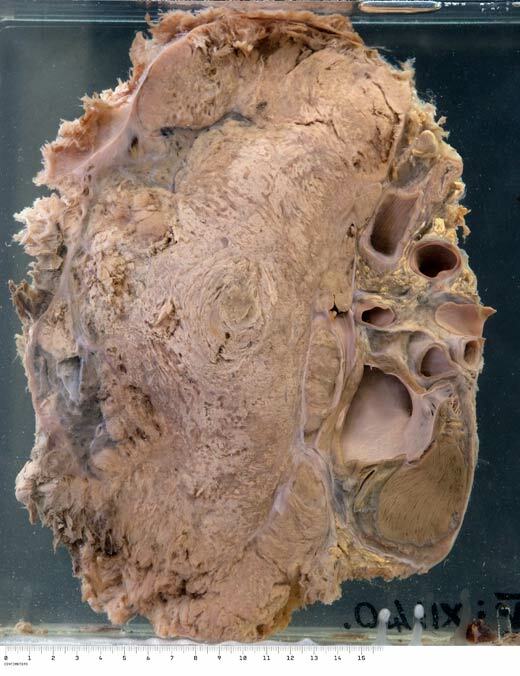 The neoplasm also invaded the mediastinum to surround the base of the heart, the great vessels and main bronchi and the superior vena cava at the level of the aortic arch. 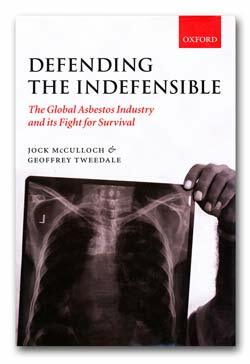 As in the history of tobacco, the evidence that asbestos was harmful was for decades deliberately suppressed by the asbestos industry and ignored by governments, resulting in suffering and premature death for tens of thousands of people. Compensation claims are ongoing. 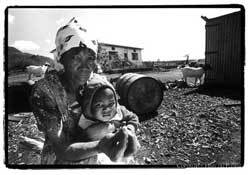 "I was a child when I started to work at the Koegas mine. There was a lot of dust and we inhaled a lot of dust. The people from the mine never told us the work would kill us. If they did, they wouldn't have had any workers. 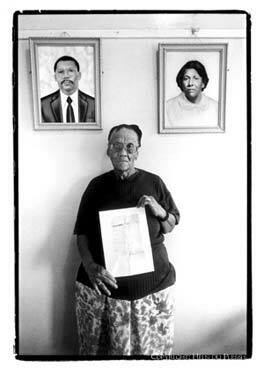 My husband worked underground at Koegas and he died in 1984. They owe me!"